from VSSC Bulletin 237 Autumn 2002. Hamish Forbes Moffatt was born in Malaya on 18th February 1931, the son of Malcom Forbes, a rubber plantation manager and former soldier. In 1939 Malcolm rejoined the army but was taken prisoner by the Japanese. His family escaped to Australia and after the war were reunited with Malcolm and came to England taking up fruit farming in Suffolk. Hamish went to agricultural college and then did his National Service. He bought a hill farm, Hafod Yspytty, north-east of Ffestiniog in North Wales and there, apart from raising sheep, he began a lifelong interest in acquiring and racing vintage cars. 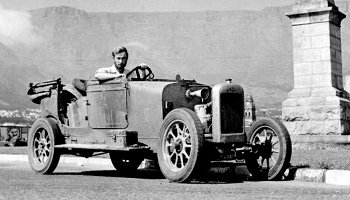 At the age of 21 he decided to travel on his own in a 1923 Lagonda tourer and drive the length of Africa. He set off from London on 21st December 1952, boarded a freight aircraft and flew from Lympne airport to Le Touquet. 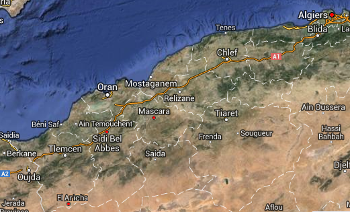 He drove down through France to Marseilles and caught the ferry to Algiers. After many adventures over six weeks driving through Algeria, Morocco, down to the Congo, Uganda, Kenya and Tanganyika covering 12,500 miles and many running repairs, he made it safely to Capetown, South Africa. His account of the journey was published in the Vintage Sports-Car Club bulletin in Autumn 1953 and reprinted in Peter Hull’s “History of the VSCC”. This extract gives you an idea of the difficulties. Arrival in Capetown, South Africa. After this adventure, he returned to life on the farm in the Welsh Hills. He married Daphne Roscoe and they had two children, Oliver and Imogen. Hamish kept his love of vintage cars and he bought the first of several racing cars a Bugatti T23A Brescia in 1953. He later added two more Bugattis, a 35T and 35B and an English Racing Automobiles R3A in 1965. He took part in vintage races in the sixties and through to the early eighties winning over 200 trophies including the VSCC Boulogne in 1980, the Vintage Seaman in 1981 and the GP Itala in 1980 and 1981. He was a member of the Vintage Sports Car Club for forty years and helped establish the Herefordshire Trial event. 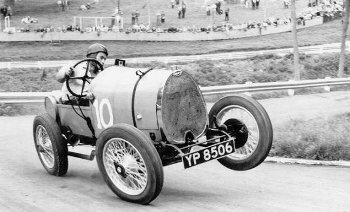 Here is a famous photograph where he is seen cornering his 1923 Bugatti T23 Brescia at the Pardon Hairpin on the Bugatti Owners Club’s Prescott Estate track near Cheltenham around 1960. After his marriage broke up in 1967, Hamish had his last long distance adventure, travelling to Australia in a 1928 Italian OM tourer. It was built by Societa Anonima Officine Meccaniche in Brescia, Italy and Hamish had loaned it to the Montague Motor Museum at Beaulieu. Setting off in November 1969, he drove through France, Italy, Greece, Turkey, Afghanistan, India and finally ended with the relatively straightforward drive from Perth to Sydney. In the seventies, he turned his interest turned to vintage aeroplanes and in 1981 with his second wife, Edwina (known to everyone as Bunty), bought Woodlow Farm in Bosbury, in particular because there was a suitable field for a grass airstrip. However this was not an easy place to land as visiting pilots discovered. 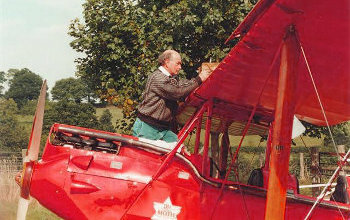 Over the years he owned various planes including a French single-wing Brochet Pipistrelle and two British-designed biplanes, a Currie Wot and a Comper Swift, but his favourite was the red 1928 de Havilland Gipsy Moth biplane, DH60 GMW Moth G-AADR. Hamish was well-known in Bosbury for his flying exploits including the regular flour-bombing of the VSCC meeting held every New Year’s Eve at the Verzons Hotel, near Ledbury. In 1988, things went slightly wrong and his escapade came to the notice of the national press! After a life full of excitement and adventure, Hamish Moffatt died on 7th June 2002 and he lies buried beneath the turf of the airstrip at Woodlow Farm, Bosbury.